This picture was taken at the top the top of Rumi Capitan. Friday night everyone comes to our house for English speakers small group and Bible study. Now that we live in town, lots of people come on their bikes. All the bikes piled up before bible study. Saturday I went to the hospital to discharge my chicken pox patient. You usually do not admit chicken pox, but it can be real bad. This guy was in the beginning of sepsis when he arrived at the hospital. Worst case of chicken pox ever! The whole body looked like this. Then an afternoon at a 7th grade class party with bonding and trust games at the local freshwater pool. The pool is fed by a local creek so sometimes you feel a little nip from something. Plus it is so cold. I have rarely stayed in more than 4-5 minutes. 7th grade parents students teachers bonding at the local pool. Allison in the middle of it all. Then some pigs in a blanket and locally made and grown french fries. Esperando papas fritas. Las mejores de Curatown! Today church followed by a trip to the local lookout, Capitan Rumi, with friends to eat cobbler and enjoy God’s creation. Encouragement comes in many forms. One unexpected form of encouragement that we have received in our work here is the joy of having repeat visits from volunteers. Tonight we had Dr. Rob Fisher, and anesthesiologist from Las Vegas, to our home for dinner. He was here last year with his wife serving for three weeks, and he has just finished another two week assignment in the hospital. It is weird that having someone come back to be a part of the work can lift your spirits, but it does. It is like a stamp of approval that says “What I think your doing is important. I want to be a part! And in fact I like it so much I am going to keep coming back each year to be a part!” Maybe it is because Rob is generous and encouraging that we are thankful for him. But I think it is something more. I think God works through us as we encourage one another. Possibly by serving and helping one another the Holy Spirit has a platform from which it can amplify the encouragement. I don’t know what it is, but I am thankful for people like Rob who come to help. Dr. 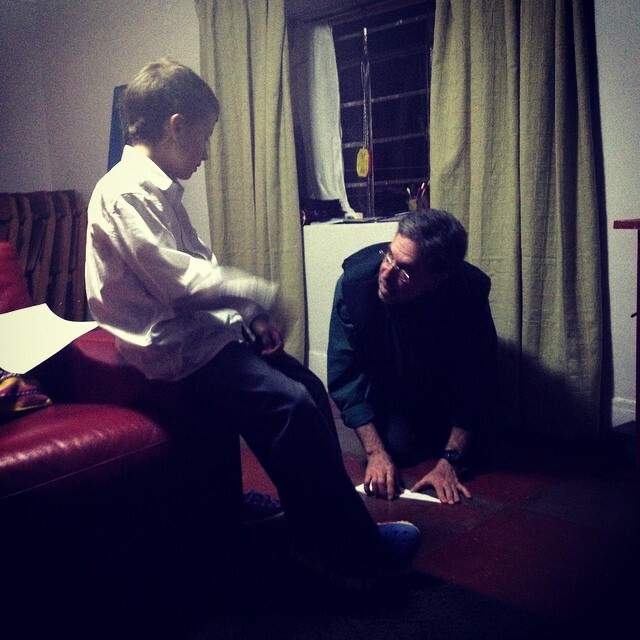 Rob Fisher teaching Peter new airplane designs. In Peru they do not routinely vaccinate against chicken pox. So I am seeing this disease that I rarely saw in the US, because they started vaccinating kids about the time I finished medical school. Today a young man came in weak, with fever, and this rash all over his body. There were so many vesicles, so tightly bunched together, that at first I did not recognize what I was seeing. It was clear to me however that I did not want what he had and that it looked contagious. As I took a breath and made a second look I realized that it was chicken pox, and that it was possibly the worst case I had ever seen. I immediately wondered whether this patient might have HIV. If he did, then the suppression of the immune system would make chicken pox look terrible. I checked him for encephalitis and pneumonia, both of which can occur with chicken pox in adults. However, the most likely situation, and the outcome in this case is that chicken pox is just worse in adults. Kids rarely look like this, and I guess that is why they had pox parties when we were kids. Parents wanted kids to have it early in life when it is less severe to avoid infections like this as adults. Chicken pox in Peru. An almost absent childhood disease in the US thanks to vaccinations making its mark in Curahuasi. This mother was a little worried that her kid was not gaining enough weight!? So cute and chubby! Mothers in Peru are always worried that their kids are not fat enough, and patients always ask me if they are heavy enough. In the US everyone wanted to be skinny. Here everyone wants to be a chubby if not fat. When my patients take pictures of me, I take pictures of them in return. This was our first trip with just our nuclear family in over two year that was more than an extended weekend. We have had some really awesome adventures and mini-vacations with friends and family, but there is something special about being with just your own family. We were glad to see a little bit of the south of Peru. I share the pictures so you can see how pretty and interesting this country is. Lunch break. No fast food in sight. Warning sign you do not see every day. Boys and fires go together. Another church in Arequipa. We love Arequipa! Walking the streets at night. A cloistered convent that is almost 500 years old. Feeding the pigeons in the plaza. Rest stop at 14000 feet. Enjoying a boat ride on the lake. At 14,000 feet with mountains still towering above us. I think we are back . . . I deleted a lot of posts from our blog, and I think that has fixed things. I had to work on some of the widgets and hopefully we will be up and running smoothly. If you are one of the rare persons who searches our blog for their favorite post in the past, it may not be there. However, I think most will be there as I only had to delete some. It has been an incredibly busy and somewhat stressful few weeks. We have moved houses and we are thankful to God for the new place we find ourselves. We are in town, which will hopefully allow us to connect with the people here a little better. We can also be more involved with our church and other outreaches more easily. We will miss the quiet and the reliable water of the country, but so far we have only run out of water once, and the next day we were up and going again. It is interesting here, because the water is only on for a couple hours every morning. If you don’t have a tank to fill (we have one) you are out of luck after about 7:30 AM. I really am thankful we have a tank, and I wonder how the people do it who do not have one. We are waiting on some furniture to be delivered that we have had made. Our new house was unfurnished, so we have had to get all of our furniture made. That is nice because it comes made the way you want it, but it is a challenge because sometimes it actually doesn’t come how you envisioned it, nor does it come at the time you thought it would. It is about a month late at this point, so we are still living partially out of boxes in our living room and bedroom. We have had good practice at patience, because our kitchen cabinets were ready about 3 months later than expected. We still have a nice view of the mountains from our backyard which is a great blessing. I praise God for his generosity in this, because we were going to miss seeing them every day. The view from our old house was spectacular. School has started. Allison is teaching English to native Spanish speakers, and she is running up against the challenges of working cross culturally in a school where the basic education of the students has been lacking. I am continuing to work in the hospital with enthusiasm at times, and other times a bit of burnout. We are looking forward to a visit home this coming winter. We should be home during the months of November 2015 through February 2016. We have been reviewing our contribution statements, and for those of you who support us we are so thankful. It is a light in a sometimes dark season that encourages us and lets us know that you love us and trust us, and that God loves us and trusts us through you. It encourages us to work hard for the faith you have put in us. Thank you very much. A more normal post in the future, but that is where we are currently with thoughts to be developed more fully in the future.